Halloween Wedding Ideas that will inspire you to create a stylish and fun wedding. Halloween is a lovely time of year to get married! The heat of the summer is behind you and the cool crisp days of autumn are upon you. Even if you're using black cats and witches with brooms you can choose the elegant, happy side of Halloween instead of the ghoulish Count Dracula. If you're getting married on October 31st, a Halloween theme will definitely work for you. If you're having a religious ceremony I would leave the Halloween Spirit for the reception and just use fall colors for your arrangements and pew decorations. 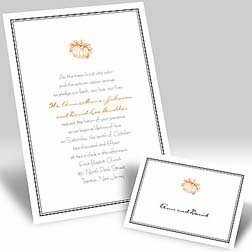 Your invites set the tone for your upcoming nuptials, so choose an orange invite or a beige invite with a Halloween design. I've seen some black invites with orange writing to convey a Halloween theme, if that's the look that you're going for remember to make sure that your Halloween invitations have large enough lettering so that your guests don't have to strain their eyes to read about your nuptials. If you look good in orange you can have an orange dress made by a dressmaker, or you could purchase an orange prom or cocktail dress. 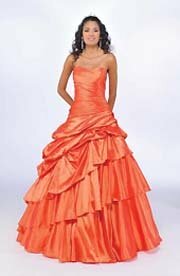 The above dresses are from Best Bridal Prices, click on the banner below to see all of their orange dresses. If orange is not your color you could choose a traditional white dress and carry an orange and black floral arrangement. Want to spruce up your Halloween look? Wear orange jewelry. Your bridesmaids can also wear orange or black dresses and carry a smaller version of your bouquet. They too can wear orange jewelry and an orange ornament in their hair. Happy is the groom who can wear a black suit with a Halloween tie. Or if he prefers to be dressed more formally, how about a black tux with an orange cummerbund and orange boutonniere? 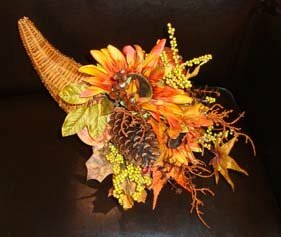 Pumpkins, autumn flowers, and horns of plenty are quite popular for a Halloween bridal centerpiece. They're colorful vibrant autumn hues are elegant and will add a touch of class to your reception hall. Avoid whimsy black cats, witches, ghosts and ghoulish accents. You want your wedding to have a Halloween Theme not a children's costume party. 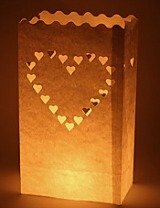 Consider these luminary bags to guide your guests to your reception room or use them to decorate your place card table or anywhere else that you deem appropriate. This inexpensive floor decal can dress up your dance floor and may help get your guests up and dancing. 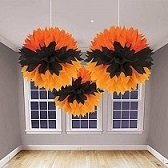 I just love these hanging ceiling decorations ceiling paper hanging decorations that will certainly dress up your reception room and look chic and festive. Ceiling paper leaf decorations can be scattered around your centerpieces on your tables, placed on your place card table or anyplace that needs a little autumn color. How about these hanging paper balls? 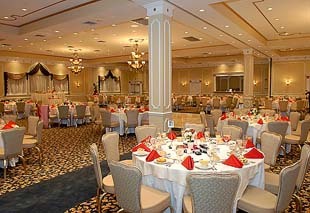 Remember to ask your caterer if they can arrange to have orange table cloths and black napkins. You can reverse the colors if you think there will be too much orange and that your centerpieces will stand out more if they're on a black table cloth. Or you can add just a hint of orange in the napkins as shown above. The wedding cake is the focal point of your reception so a Halloween theme cake is definitely in order. 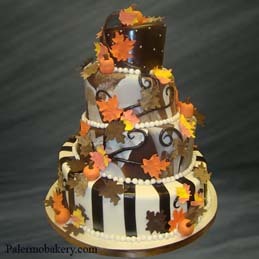 This four tier, slightly askew cake is decorated with richly colored leaves and pumpkins. The fall colors can make you almost feel the crisp autumn air. How about serving Bloody Mary's or a champagne punch with orange sherbet when your guests arrive. Take a trip to the Dollar Store and purchase Halloween stirrers. 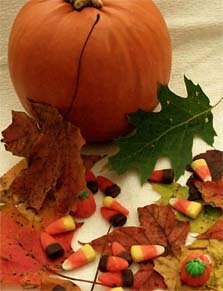 Your Halloween food can serve two purposes – food for your guests to eat and as a decoration. 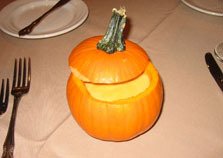 In addition to your wedding cuisine you, can serve Pumpkin Soup in a pumpkin. You can have cookies baked in the shape of pumpkins, black cats, and witches which can be set out on your guest's table. 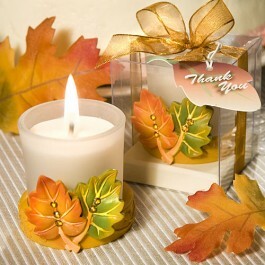 Consider giving these lovely autumn leaf candles as your favors so your guests will have something useful to remember your special wedding day. Whatever Halloween wedding ideas you choose to use, my advice is to keep your ceremony and reception classy, elegant and fun. Take a look at some great ideas at our Introductory page.